It’s that time of the year when the comic and anime film fanatics rejoice at one of the most popular festivals of the country, Comic Con. This year Comic Con has already raised bars and the expectations from the 2-day convention are quite high. Nick Seluk, creator of the very popular Web Comic The Awkward Yeti, David Lloyd, British comics artist best known for V for Vendetta, Andrew Griffith, comic book artist, designer and illustrator of Transformers comics series, Yishan Li, professional comic book artist for DC & Dark Horse Comics & Nicole Marie Jean, International Pro-Cosplayer are coming to attend Maruti Suzuki Mumbai Comic Con 2017. Don't miss out an awesome performance by Youtube Fan Favorite & Mumbai's very own - Prajakta Koli. Catch the very popular team from Beyounick performing Live on our main stage! Mallika Dua & Sahil Shah will be performing at the show too. Maruti Suzuki Mumbai Comic Con will feature multiple fan experiences, from action-packed main stage to the Maruti Suzuki Zone, Disney Fan Experience, Justice League Experience, AXN Experience Zone and Mountain Dew Zone along with many more! 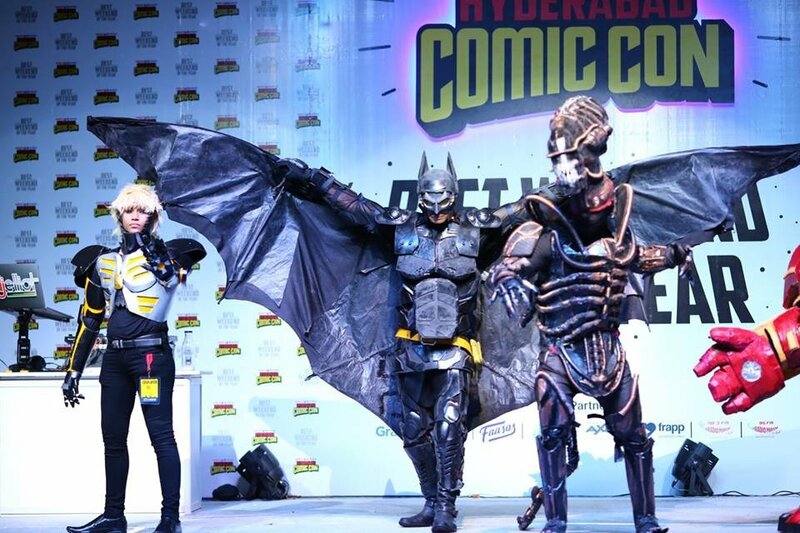 Cosplay, one of the major attractions at Comic Con India, will continue to give assured prizes to people in great costumes. Comic-Con India under its 5 categories -1. Comic book/graphic novel 2. Animated Series/Movie 3. Manga/Anime 4. Sci-Fi/Fantasy and 5. Gaming will choose one winner in each category each day. Also, One lucky winner out of the chosen 5 will get an awesome chance to win INR 50000 (Cash Prize) Each Day! The winners each automatically enter the running to represent India at the Crown World Championship of Cosplay in Chicago. Exclusive Comic Book & WebComic LaunchesCatch exclusive launch of 6 Comic Book & 4 Webcomic launches at Mumbai Comic Con 2017. These Comics include Rhyme Fighters: Odes to our Unsung Heroes, Footsteps 2 - Horror Comic Book, Age Of Immortals #3, Rudra - Launch of New Indian Superhero, The guide to hipsters, State Bank of comics, Oye Chhotu and much more. The show features creators from all over India, such as Abhijeet Kini, Aniruddho Chakraborty, Sailesh Gopalan, Saumin Patel, Vivek Goel, Rajeev Tamhankar, Sumit Kumar and much more.